Soak the tamarind in warm water for 10 minutes. Kneading with your fingertips, extract juice and discard pulp. Cook Red Grams in a pressure cooker with enough water until soft and mushy. Mash further with a potato masher to remove any lumps. Keep it aside. Crush the Garlic Pods, Peppercorns and Cumin Seeds. Keep it aside. In a thick bottomed vessel, mix the mashed Red Grams with Tamarind juice, Asafoetida Powder, Turmeric Powder, Coriander leaves, Salt, 2 cups of Water and the crushed ingredients from step 3. Heat the vessel and allow the contents to boil for 2 minutes. Now switch off the stove. Heat oil in a small pan and splutter the mustard seeds. Now add the curry leaves and dry red chillies into the same pan and fry for a minute. Pour this seasoning over Rasam. 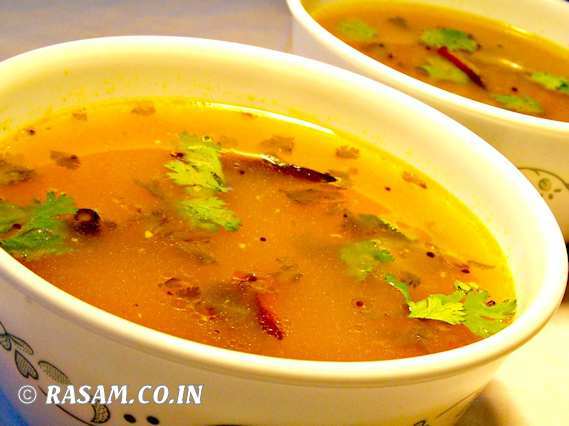 Garnish Rasam with Coriander Leaves and serve it hot with rice or you can even have it as a soup.